French Somaliland (French: Côte française des Somalis, lit. Somali: Xeebta Soomaaliyeed ee Faransiiska) was a French colony in the Horn of Africa. It existed between 1883 and 1967. It was established between 1883 and 1887, after the ruling Somalis and Afar sultans each signed a treaty with the French. The March 11, 1862 agreement the Afar sultan Raieta Dini Ahmet signed in Paris was a treaty where the Afars sold the territory of Obock for 10 000 thalaris, around 55 000 francs. Later on, that treaty was used by the captain of the Fleuriot de Langle to colonize the south of the bay of Tadjoura. In March 26, 1885 the French signed another treaty with the Somalis where the latter would become a protectorate under the French, no monetary exchange occurred and Somalis did not sign away any of their rights to the land, the agreement was to protect their land from outsiders with the help of the French. However, after the French sailors of the vessel Le Pingouin were mysteriously killed in Ambado in 1886, the French blamed first the British, then the Somalis and further used that incident to lay claim to the entire southern territory. 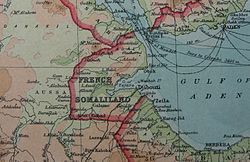 The French “Côte francaise des Somalis” (literally "French coast of the Somalis") is said to have been proposed by Mohamed Haji Dide of the Mahad 'Ase branch of the Gadabuursi. He himself before the arrival of the French was prosperous merchant of Zayla and the sultan. He came on to build the first Mosque in Djibouti City "Gami ar-Rahma" in 1891. The construction of the Imperial Ethiopian Railway west into Ethiopia turned the port of Djibouti into a boomtown of 15,000 at a time when Harar was the only city in Ethiopia to exceed that. Although the population fell after the completion of the line to Dire Dawa and the original company failed and required a government bail-out, the rail link allowed the territory to quickly supersede the caravan-based trade carried on at Zeila (then in the British area of Somaliland) and become the premier port for coffee and other goods leaving southern Ethiopia and the Ogaden through Harar. The railway continued to operate following the Italian conquest of Ethiopia but, following the tumult of the Second World War, the area became an overseas territory of France in 1946. In 1967, French Somaliland was renamed the French Territory of the Afars and the Issas and, in 1977, it became the independent country of Djibouti. ^ Chisholm, Hugh, ed. (1911). "Somaliland: French Somaliland" . Encyclopædia Britannica. 25 (11th ed.). Cambridge University Press. p. 383. ^ Raph Uwechue, Africa year book and who's who, (Africa Journal Ltd.: 1977), p. 209 ISBN 0903274051. ^ A Political Chronology of Africa, (Taylor & Francis: 2001), p. 132 ISBN 1857431162. ^ Henri, Brunschwig (1968). Histoire Africaine. Cahiers d'Études africaines. pp. 32–47. ^ "Tracer des frontières à Djibouti". ^ Adolphe, Martens; Challamel, Augustin; C, Luzac (1899). Le Regime de Protectorats. Bruxelles: Institut Colonial Internationale. p. 383. ^ Simon, Imbert-Vier (2011). Trace des frontiere a Djibouti. Paris: Khartala. p. 128. ^ Rayne, Henry a (2015-08-08). Sun, Sand and Somals; Leaves from the Note-Book of a District Commissioner in British Somaliland. BiblioLife. ISBN 9781297569760. ^ Farah, Rachad (2013-09-01). Un embajador en el centro de los acontecimientos (in Spanish). Editions L'Harmattan. p. 17. ISBN 9782336321356. ^ " Chisholm, Hugh, ed. (1911). "Jibuti" . Encyclopædia Britannica. 15 (11th ed.). Cambridge University Press. p. 414. ^ Chisholm, Hugh, ed. (1911). "Abyssinia" . Encyclopædia Britannica. 1 (11th ed.). Cambridge University Press. p. 86. ^ " Chisholm, Hugh, ed. (1911). "Zaila" . Encyclopædia Britannica. 28 (11th ed.). Cambridge University Press. p. 950. Imbert-Vier, Simon (2008). Frontières et limites à Djibouti durant la période coloniale (1884–1977) (PhD thesis). Université de Provence–Aix-Marseille I.